More often than not, India is a symbol of blazing heat, desert and monsoon on overcrowded megalopolis and few would expect to put on their ice skates, grab stick and play a hockey game but believe it or not, our national sport is extremely popular in a lesser known region of the Indian sub-continent. Ladakh, a region of the Jammu and Kashmir state lies in a high altitude in Northern India at the foot of the Himalayas. The region appropriately nicknamed “Little Tibet” because of its ethnological, social and geographical similarities with the country has a climate similar to ours. Its cold seasons make it possible to practice winter sports just like in Canada. Ice hockey was introduced in Ladakh in the 1970s by army regiments and the official local league, the LWSC was officiated in 1985. 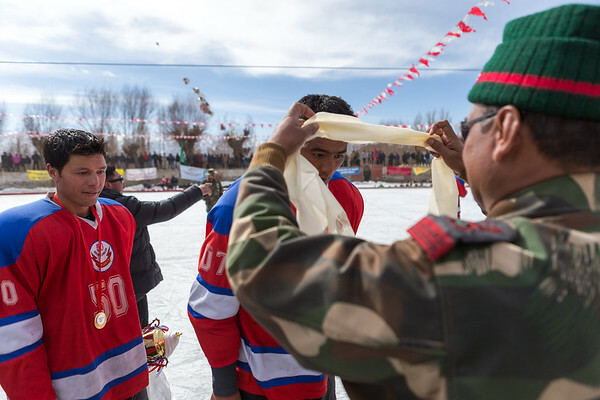 All the teams are formed by different regiments of the Indian Army and compete every year during the two or so months cold enough to have a skating rink. Fans enthusiasm could remind us of Montreal if it was not for the lack of oxygen and incredible views over the Himalayas.